Always a fan of the arts, I, like all of the other starving artists out there, am just trying to cut out a place in this world. I devised the FEATURED ARTIST concept to diversify the scope of the website and give credit to up-and-coming graphic artists and photographers who work as tirelessly on their crafts as I do on mine. Every four-to-five months, a new artist will be featured and interviewed as part of the series. To inquire about becoming a FEATURED ARTIST, see the CONTACT page. I had the privilege of interacting with Ontario-based artist Paula Sherry on Twitter after being taken by her work. Petals by Paula grew out of a passion and love for nature, paint and clay. How these three elements combine and ignite the imagination is different yet each one is sensually alive in its own right. Flowers are seasonal by nature so a pairing of artistic works grew alongside this endeavour. It is a labour of love and getting all the pieces to work together has not been an easy task but a definite goal. To have an imagination, to not know limitations and hard work always win out. Cut flowers are available and sold at local markets as season permits. The erection of a greenhouse will provide a lengthened season and hard to find nursery plants will be grown here. This is the nature part of Petals by Paula. I paint using acrylics and acrylic mediums. 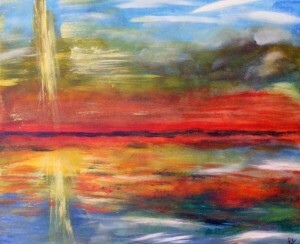 I try to breathe life into imagination showing scenes of nature in impressionistic and abstract form. All paintings are ready to hang if no frame is your preference, all are varnished for UV protection and packaged with great care. Please visit Petals Art Shoppe,this is imagination in visual form becoming reality on canvas. My hand built ceramics feature my Soul Fusion figurines all one of a kind sculptures depicting our soulconnection to one another. Also available are my handbuilt Petals signature bowls and sculptural handbuilt functional ware. All ceramics are fired to Cone 6 and are stoneware. Most are dishwasher safe and food friendly. Each piece is unique and has its own characteristics and character that can be recreated but never imitated. Custom orders are available upon request. Please visit the Mudroom to see imagination come to life in three dimensional form with the use of clay.